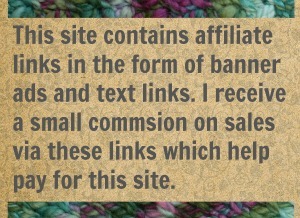 I preach the benefits of blocking knit and crochet all the time. Blocking is nothing to skimp on, I’ll earnestly insist. You spent all that time making the piece. Justify your investment with a good block. I block nearly everything. 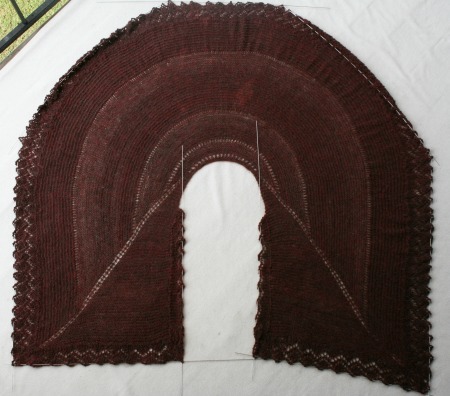 And even so I’m often amazed at what blocking can do. In this case blocking made my Pie Are Square shawl so much bigger that I had a hard time getting it all in the camera frame. It really opened up and took shape. Now blocking is a skill that improves with practice and experience. Each piece blocks a little different. You never quite know what you are getting into until you have a mess of wet yarn in your hands. 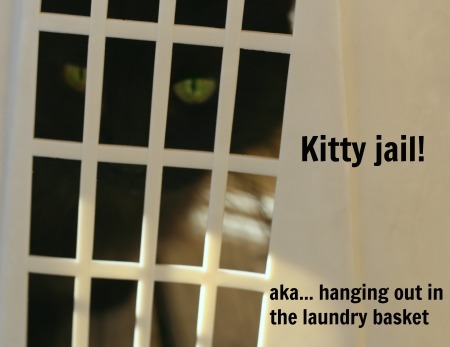 Then its like a mini-adventure with fresh discoveries around every wet yarn-y corner. I took pictures at every step of my blocking mini-adventure. I knew ya’ll would appreciate that. Blocking for me starts with an old blanket spread over my porch and a Feline Overlord to monitor my every move. 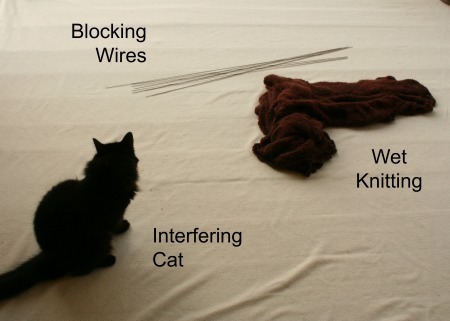 I also had a set of blocking wires from Knit Picks. Blocking wires are thin, flexible rods measuring almost 3 feet long. They are great for blocking big pieces or pieces that have curved edges. This Pie Are Square shawl ticked both those boxes so I was glad to have them. 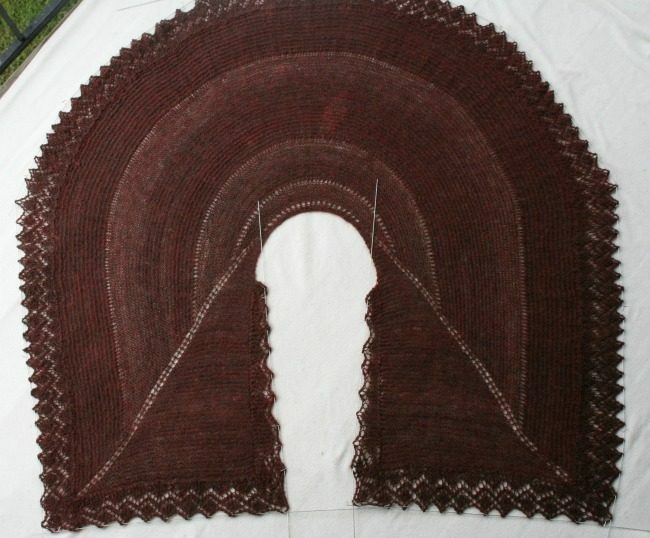 But before I set those wires, I opened up the shawl and pushed it into shape with just my hands. This is like making a first pass at the blocking. Its a rough shape. I didn’t worry too much about getting the edges straight, not yet. 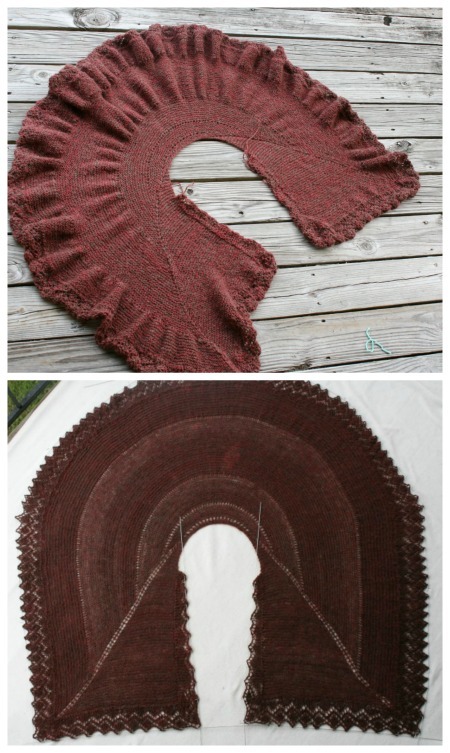 I just wanted to open up the shawl and get it spread out and laying flat. I always work from the center out, inch by inch. 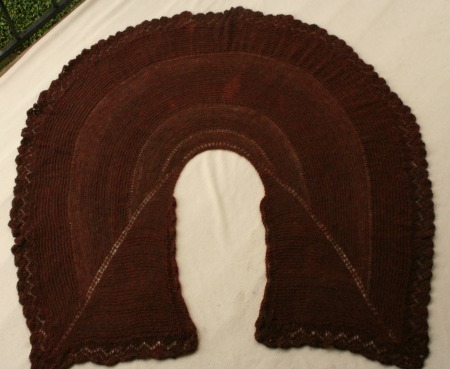 The shawl seemed to settle into this shape all on its own. I have to admit this is when I was surprised at how big it was. No wonder this shawl took me so long to knit! Next I threaded the wires. 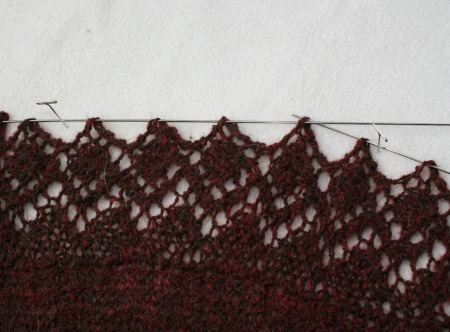 I went into every tip of the lace border. Where two wires meet up, go into that tip with both wires. It took nine wires to cover all the edges. 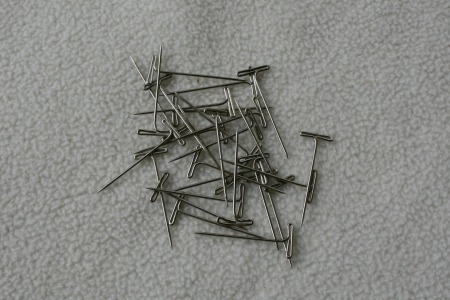 Nine wires was so much easier than setting a pin into every one of those lace tips! Not that you don’t need straight pins when you use blocking wires. You do. Just not nearly as many. So next I started stretching the shawl out. I pulled gently on those wires and then used a few pins to hold them in place. I took a few quick measurements and its just shy of 5 feet long and nearly as wide. Nice and big! I’m pretty happy about that. The final step in blocking is to say a quick prayer for no rain. My blocking has to be outside, there is no getting around it. If you lived with the Feline Overlord all your blocking would be outside too. So I just need the sky to stop dumping water all over Austin (which its been doing every day for a week) for a few hours. Those are the best prices I could find. Jo-Anns has a set for $33. Churchmouse has a set for $42. That seems a bit overpriced to me but I’ve never tried them. Maybe they are worth paying double. Shrug. And on a final note, here is Craftsy’s free photo tutorial for using blocking wires. If you believe in blocking like I do, blocking wires are a worthy investment. I recommend them. 22 Comments on "The Magic of Blocking"
Stunning! you really outdid yourself on this one Jenn. Your Mother will love it. It blocked out so much bigger than I expected too. Now I want some blocking wires for myself. I have my fingers crossed for you on the subject of rain. Alpaca takes soooo long to dry. Finger and toes crossed! And yeah, alpaca can take awhile, especially when there is no sun. Texas really has gotten gipped this spring in the sunny day department. Mom should like it. Its warm and it big. I smile every time I think about her all snuggled up in it. Lovely. That edging is the finishing touch. Thanks! That edging was a lot of work but totally worth it. On its own the all garter sticth would have been too dull. So I’m glad I went with teh edge even if it did put me behind. Absolutely gorgeous, Jen! You did a fantastic job of blocking. Do you block sweaters the same way? Just finished my first sweater…for me! Need to give it a bath. They make doing the pinning go quickly, after putting in the wires. I will pray for hot sun and a gentle breeze for your drying. I have used wires to block sweaters, yes. I thread them through the arms and through both front and back of the bottom edge. 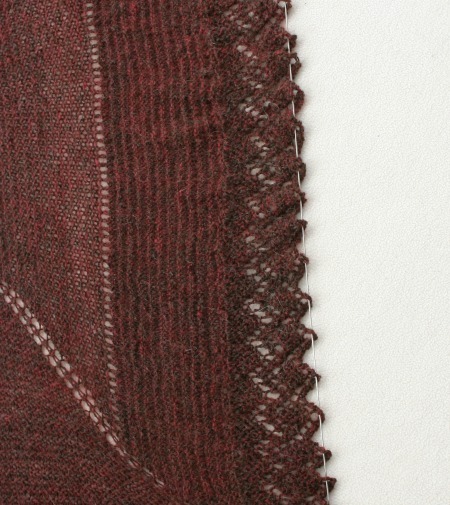 I don’t put as much tension on sweaters as I did with this shawl but the method is the same. Wires are pretty handy.A sweater frame would be best but sadly I don’t have one of those. And big congrats for your first sweater FOR YOU! Wash, block and enjoy that baby. Those blocking wires are cool. I’m not a knitter but I’ll bet I could use them in my crochet work. Great post! Oh yes they work for crochtt. 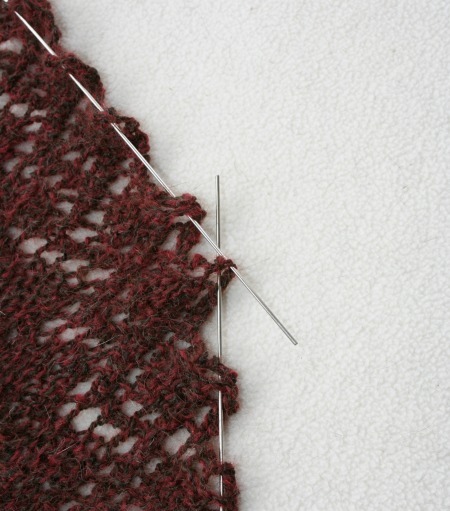 In fact, in blocking crochet you often need to put more tension (then for knitting) to get all those knots to line up. Wires are very helpful when you need to really stretch a peice out.